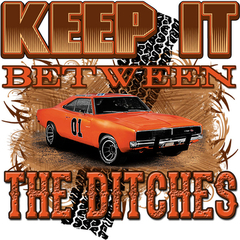 Dixie Outfitters - Branson, MO :: Keep It Between the Ditches! A must have for any true fan! This brand new design is available in t-shirts Youth 6/8 (Small) to Adult 5X. Choose your size and color below. Available in longsleeve t-shirt or hoodie through our retail store. For these orders, call us at (417) 336-3494.